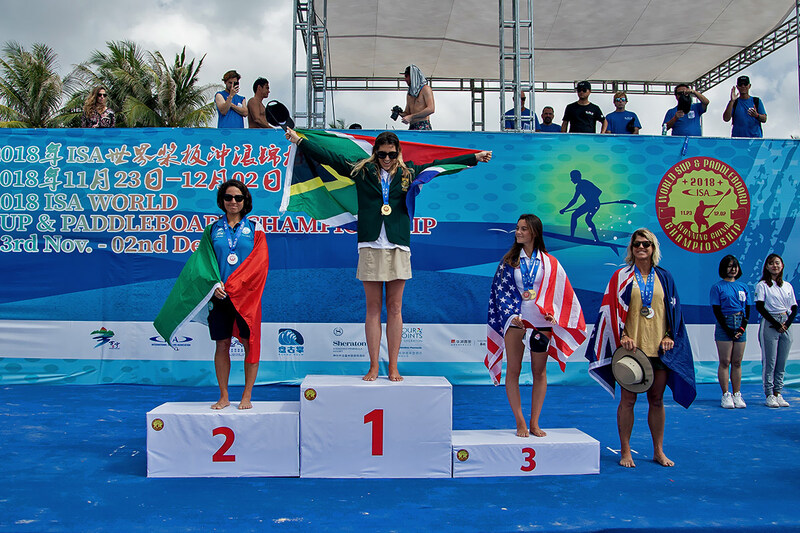 South Africa's Tarryn King earned the first gold medal for South Africa in a ISA World SUP and Paddleboard Championship, which wrapped up today in Wanning, China. King's performance comes just over a year after giving birth and returning to an elite level for SUP Surfing and Racing. King's husband Thomas celebrated on the beach with their one-year son. Her medal was backed up by a bronze by Jadon Wessels in the Prone Distance Race, and a copper for Wessels in the Prone Technical Race. 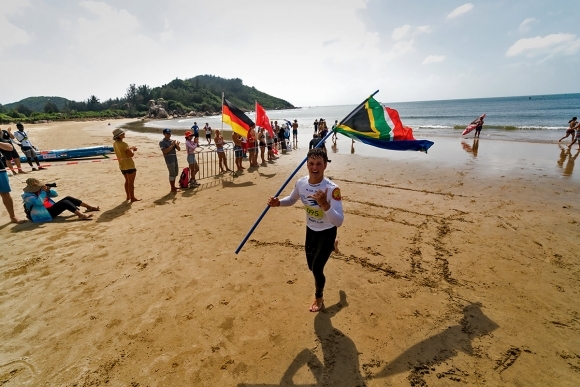 Their performances helped boost Team South Africa to ninth place overall out of 26 countries. Team Australia continued their reign on top of the sport, earning their sixth Gold Medal in seven years and extends their win streak to three in a row and an historic first Gold in the event’s history to be awarded in Asia. In a great display of the ISA’s push for the global growth of SUP, ten nations from all five continents – the Americas, Europe, Africa, Asia, and Oceania – earned individual medals during the week of competition. The Women's Sprint Final featured France's 2017 Silver Medalist Amandine Chazot matching up against Italy's Caterina Stenta, USA's Jade Howson, South Africa's King, Australia's Terrene Black, and Japan's Yuka Sato. 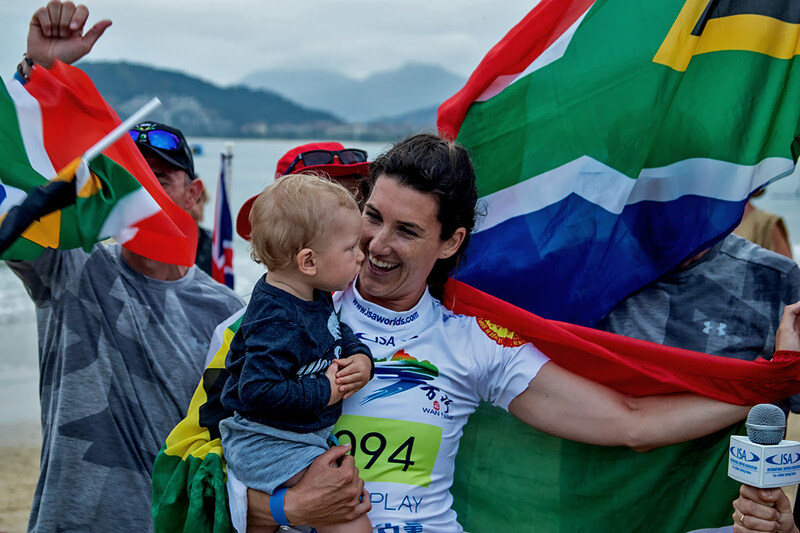 King built a decisive lead and crossed the finish line in first place to the cheers of her team on the beach: "I've put in a lot of time and a lot of training. I am so stoked. To win Gold in the Sprints is a dream come true." "It's been quite a journey from giving birth to being World Champion. I stayed fit during my pregnancy and once I gave birth, I bounced back quite quickly. I really focused on coming to compete and it all paid off." Team Australia emerged victorious, followed by USA with the Silver. South Africa came a commendable seventh, with their team comprising Jadon Wessels, Tarryn King, Penny Stemmet and Henco Scholtz. Bronze came down to a final, thrilling sprint between New Zealand’s Trevor Tunnington and Denmark’s Casper Steinfath. Tunnington edged out Steinfath by fractions of a second to take the Bronze for his nation, leaving the Copper for Denmark.